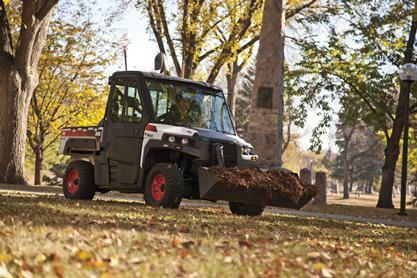 Use a bucket to haul, load, grade and dig materials with the Bobcat® 3650 utility vehicle. The 62 in. bucket is ideal for municipalities, estates, hobby farms and building and grounds facilities. Operate the boom and tilt functions using the integrated joystick from inside the cab. Use the visual angle indicator to gage the angle of the cutting edge. The bucket is designed with the Multi-Attachment X-Change™ (M.A.X.) system which allows attachments to be changed trouble-free and without tools. High-Strength Steel Cutting Edge: Features an abrasion-resistant material, which maximizes uptime. Multi-Attachment X-Change (M.A.X. )System: Makes easy work of attaching and detaching the bucket from the utility vehicle. Fast and easy mounting means spending less time on attachment changes and more time on the job. Operating Capacity: Dig and carry materials up to 500 lb. Visual Angle Indicator: Provides the operator a visual to estimate the angle of the cutting edge.